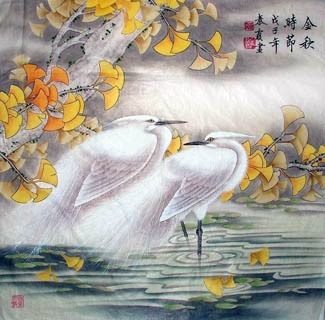 Egret/white heron, they have long filamentous feathers during the breeding season. 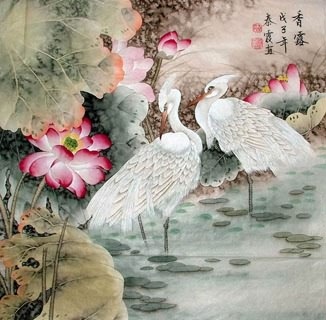 In Chinese, "egret(鹭)" and "road(路)" are homonymic words(both sound "lu"). 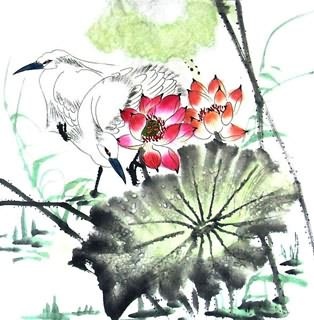 Chinese Lotus, Reed and Egret Painting: Yi Lu Lian Ke(一路连科). 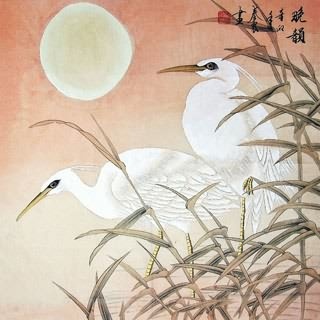 "Egret(鹭)" and "road(路)", "lotus(莲)" and "connect(连)", "reed(芦)" and "road(路)" are homonyms in Chinese, and reed is often growing together with lotus in groups(in Chinese, it sounds like the word "lian ke,连科"), so this combination symbolizes "success in the imperial examinations again and again" and "having a successful official career"
Chinese Bat, Chinese God of Longevity and Egret Fengshui Painting: Yi Lu Fu Xing(一路福星). 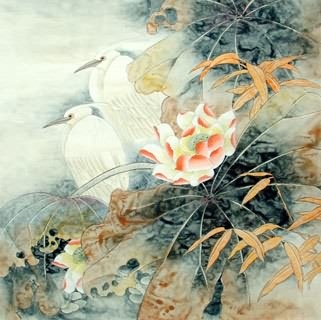 This combination expresses the wish for good luck to someone who is going on a long journey. 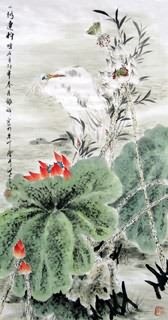 Chinese Quail, Vase and Egret Feng Shui Painting: Yi Lu Ping An(一路平安). 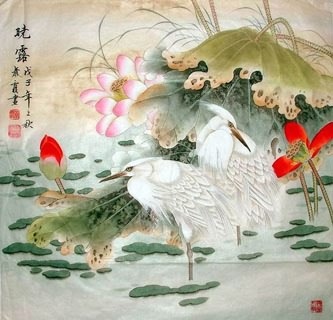 "Egret" symbolizes road, "vase(瓶)" and "safe and sound(平)", "quail(鹌鹑)" and "in good condition(安)" are homonymic words. 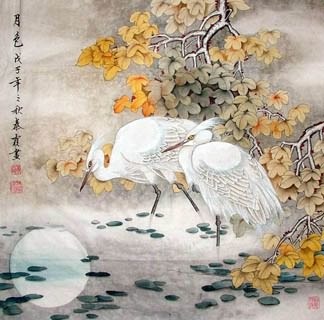 (The other combination of egret and TaiPing coin is called "Yi Lu Tai Ping一路太平"). 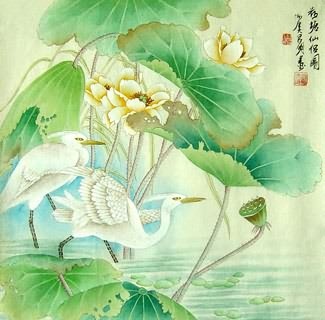 Both two combinations expresses the wish for a healthy and safe journey. 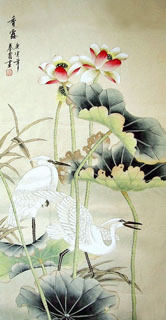 These two combinations were very common in the Ming and Qing Dynasty. 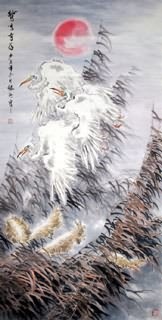 InkDance Price: USD 456 /GBP 374 /EUR 434 Sold, you can customize it. InkDance Price: USD 406 /GBP 333 /EUR 386 Sold, you can customize it. 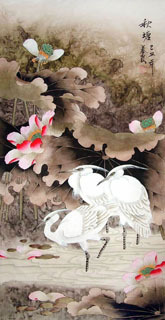 InkDance Price: USD 518 /GBP 425 /EUR 493 Sold, you can customize it. InkDance Price: USD 425 /GBP 349 /EUR 404 Sold, you can customize it.